In this tutorial we’ll learn how to install and configure Cacti network monitoring tool in the latest version of Debian and Ubuntu 16.04 LTS. 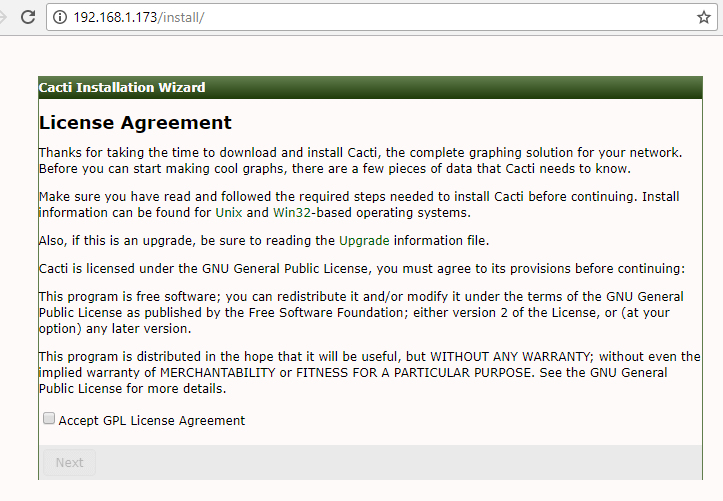 Cacti will be build and installed from source files during this guide. 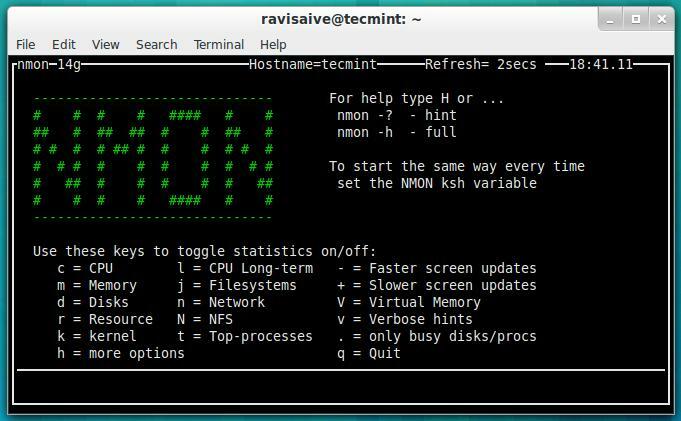 Cacti is an open source monitoring tool created for monitoring networks, especially network devices, such as switches, routers, servers via SNMP protocol. 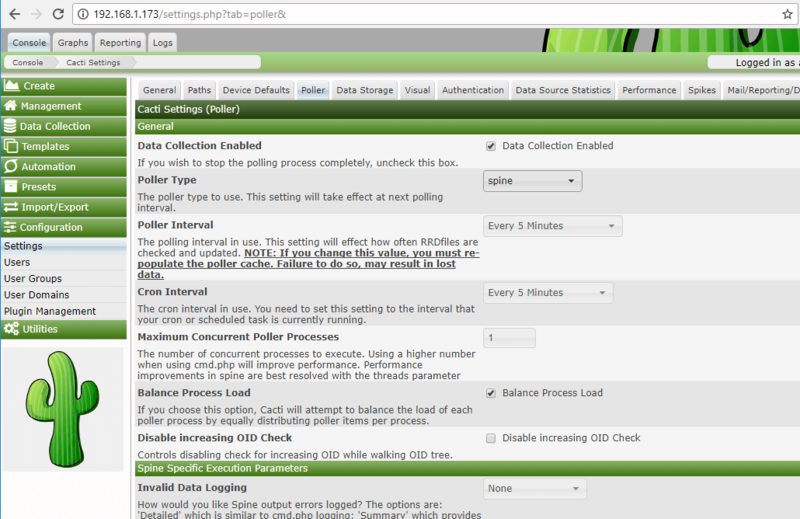 Cacti interacts with end-users and can be administered via a web tool interface. Add following lines to sources.list file. 2. Afterwards, make sure to update the system by issuing the below command. 3. In your LAMP stack make sure the following PHP extensions are present in the system. 4. Next, edit PHP configuration file and change the time zone setting to match your server’s physical location, by issuing the below command. 5. Next, log in to MariaDB or MySQL database from your LAMP stack installation and create a database for installing Cacti by issuing the following commands. Replace cacti database name, user and password to match your own configurations and choose a strong password for cacti database. 6. 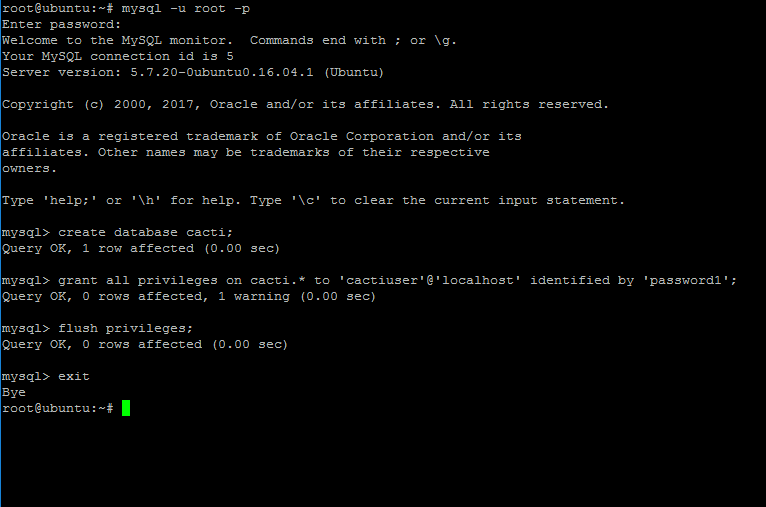 Also, issue the below commands to allow cacti user select permissions to MySQL data.timezone setting by issuing the below commands. 7. Next, open MySQL server configuration file and add the following lines at the end of the file. Add the following lines to the end of the 50-server.cnf or mysqld.cnf file. 8. Finally, restart MySQL and Apache services to apply all settings and verify both services status by issuing the following commands. 9. Start install Cacti from sources by downloading and extracting the latest version of Cacti archive and copy all the extract files to Apache web document root, by issuing the following commands. 10. Remove index.html file from /var/www/html directory, create the Cacti log file and grant Apache with write permissions to web root path. 11. Next, edit cacti configuration file and modify the following lines as shown in the below example. 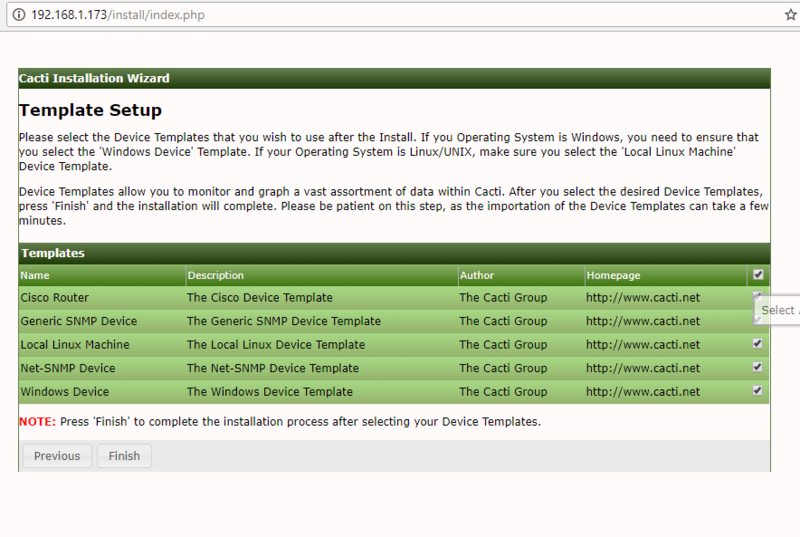 Cacti config.php file sample. 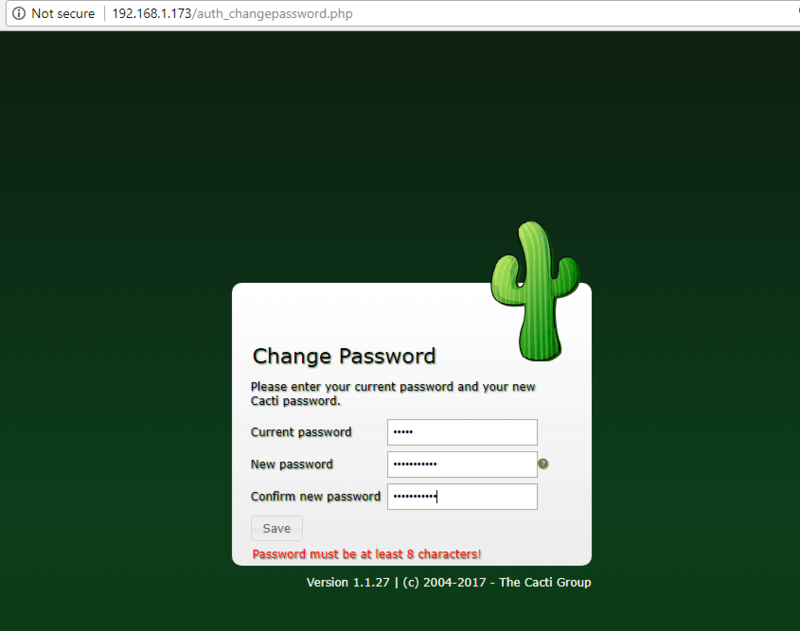 Replace cacti database name, user and password accordingly. 12. 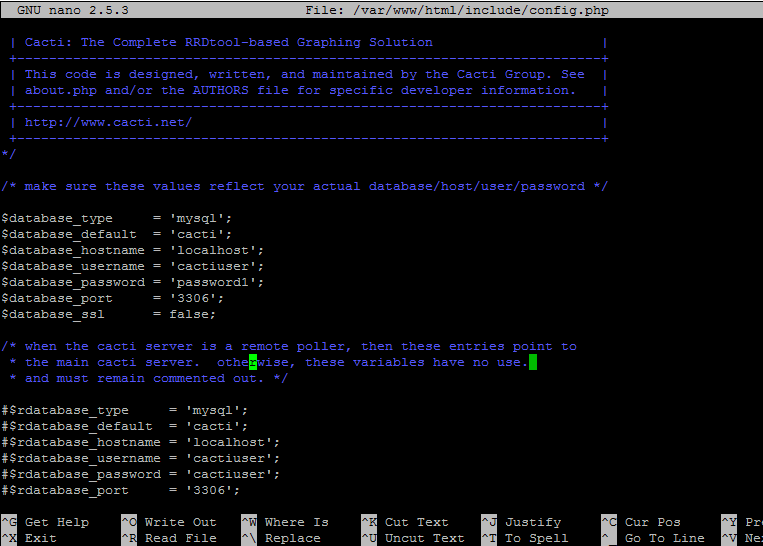 Next, populate cacti database with the cacti.sql script from /var/www/html/ directory by issuing the below command. 13. Now install some additional resources, as Cacti engine collects devices data via the SNMP protocol and displays graphics by using RRDtool. Install all of them by issuing following command. 14. Verify if SNMP service is up and running by restarting snmpd daemon by issuing the below command. Also check the snmpd daemon status and its open ports. 15. Cacti-Spine is a C written replacement for the default cmd.php poller. Cacti-Spine provides a faster execution time. To compile Cacti-Spine pooler from sources install the below required dependencies in your system. 16. After you’ve installed the above dependencies, download the latest version of Cacti-Spine archive, extract the tarball and compile cacti-spine by issuing the following series of commands. 17. Compile and install Cacti-Spine from sources by issuing the following commands. 18. Next, make sure spine binary is owned by root account and set the suid bit for the spine utility by running the following commands. 19. Now, edit Cacti Spine configuration file and add the cacti database name, user and password to the Spine conf file as illustrated in the below example. Add following configuration to spine.conf file. 20. 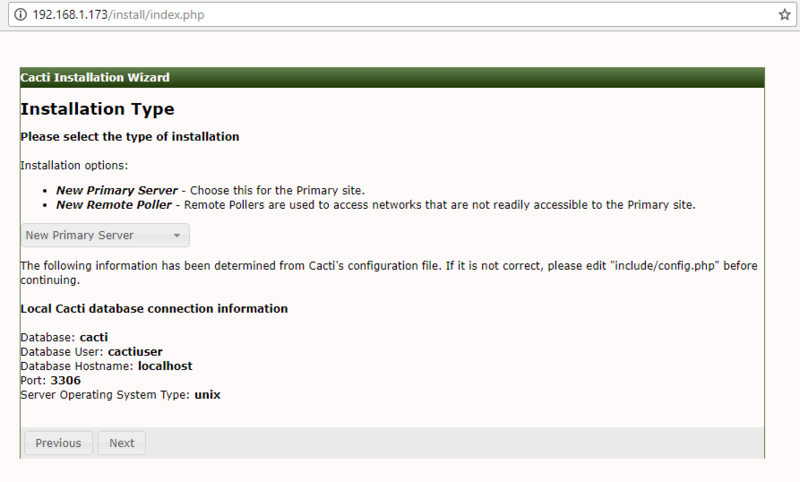 To install Cacti, open a browser and navigate to your system IP address or domain name at the following URL. First, check Acept License Agreement and hit on the Next button to continue. 21. Next, check if system requirements and hit Next button to continue. 22. 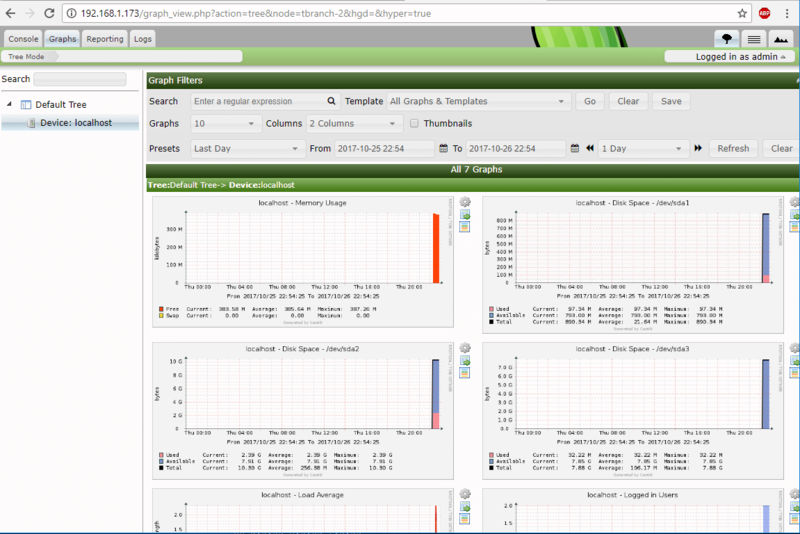 In the next window, select New Primary Server and hit on Next button to continue. 23. 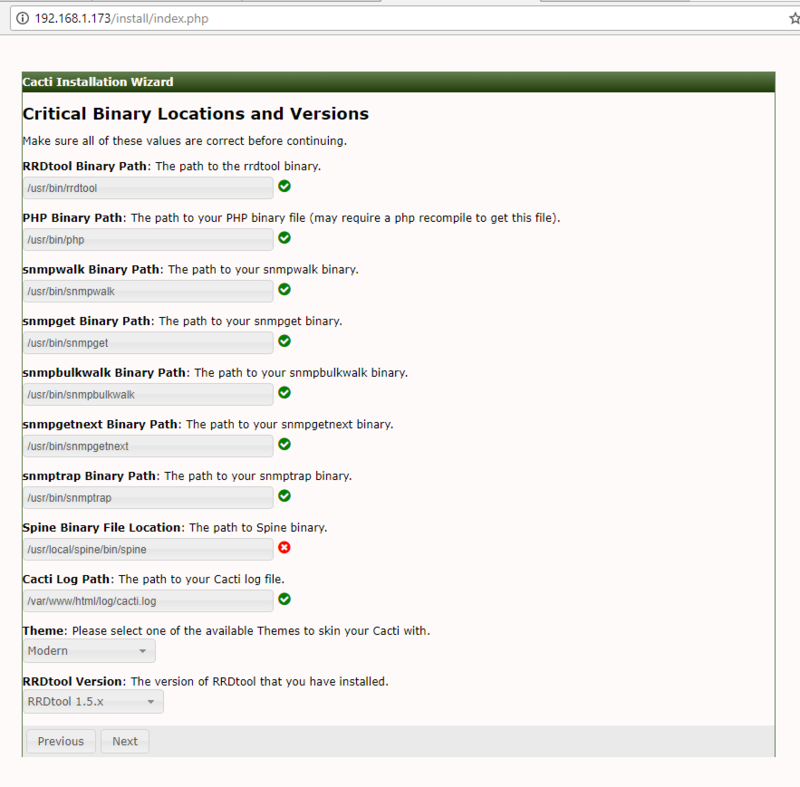 Next, verify critical binary locations and versions and change Spine binary path to /usr/local/spine/bin/spine. When you finish, hit Next button to continue. 24. 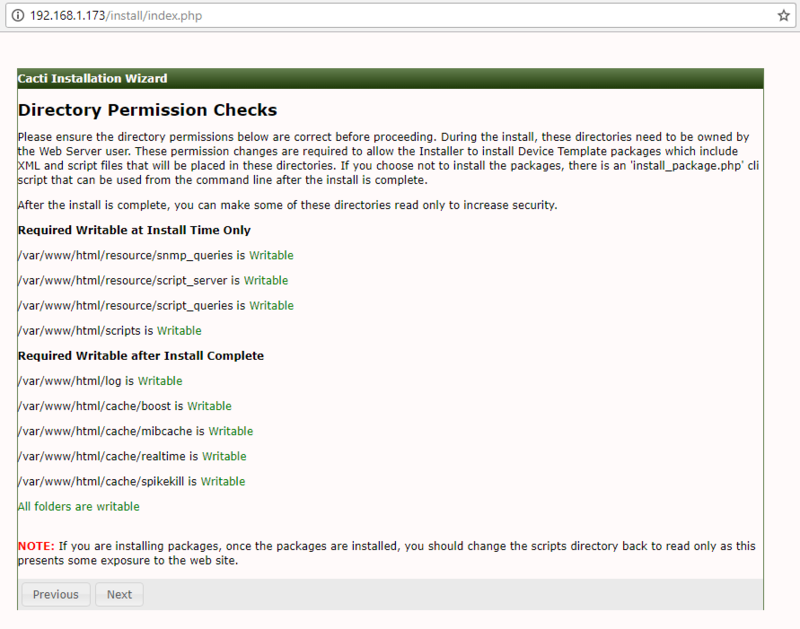 Next, check if all web server directory permissions are in place (write permissions are set) and hit on Next button to continue. 25. On the next step check all the templates and hit on Finish button in order to finish the installation process. 26. 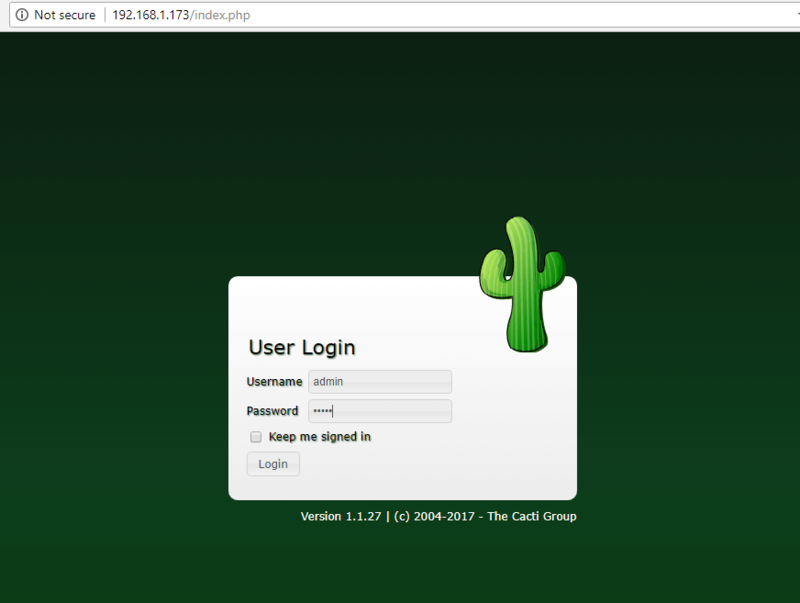 Log in to Cacti web interface with the default credentials shown below and change the admin password, as illustrated in the following screenshots. 27. Next, go to Console -> Configuration -> Settings -> Poller and change the Poller Type from cmd.php to Spine binary and scroll down to Save button to save the configuration. Hit on Save button to apply configuration. 29. The final setup which enables Cacti poller to start collecting data from monitored devices is to add a new crontab task in order to query each device via SNMP every 5 minutes. The crontab job must be owned by www-data account. 30. Wait a few minutes for Cacti to collect data and go to the Graphs -> Default Tree and you should see the graphs collected for your monitored devices. That’s all! You have successfully installed and configured Cacti with Cacti-Spine pooler, from sources, in the latest release of Debian 9 and Ubuntu 16.04 LTS server. Hi, thanks for your helpful article. When installing cacti, I go the following errors. Please advise what to do? help me ? Please remove all third-party Yum repositories and install Cacti from default repositories..
How to remove all, please give the command? Use following command to remove Webtatic, EPEL and Remi repository. Thank you very much, Matei. Not wanting to abuse, do you have some tutorial to install the Cacti Monitor and Wethermap plugins? You should check Apache error log file to debug the problem. Many thanks for this article, very helpful. Please help me step 21 (Preinstalltion checks) on my installation comes back with a blank page and nothing happens, no error message that I could see. What could I have done wrong? Did I miss some stage or step? Would be grateful for your help.